Homestead Exemption is a great and easy way to save on your annual property taxes. Under Georgia law you are entitled to a Homestead Exemption (a reduction in your property taxes) for any property that you own and occupy as your primary residence as of January 1, 2017. The exemption is not automatic, however, and you have to properly file for the exemption to save on your taxes. You will need to file with your county’s Tax Commissioner by April 1, 2018 in order to receive the Homestead Exemption for this year. Once you have filed, the exemption will remain on your property until there is a change in ownership (i.e., you do NOT need to refile every year). In order to complete the application, you will need several items as detailed on the application form, including the recording information from your vesting deed. Your recorded vesting deed should have been sent to you by the closing attorney approximately 4-6 weeks after the closing. I BEG of YOU… If you read nothing all year long from us, please don’t ignore this… Sitting in a closing a few years ago, Lesley met a seller who never realized he could file for “Homestead Exemption” on his primary residence. So, for the 6 years that he owned his home, he was paying property taxes with no homestead exemption (i.e. property tax discount for primary residents)! Not only did that cost him thousands upon thousands of dollars per year for those 6 years, it also cost our buyers months of increased property taxes until they could file for homestead exemption in the New Year! 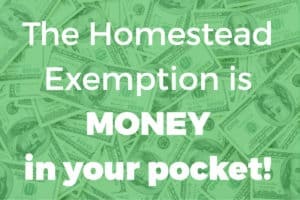 Make sure you do whatever you must do to file for your homestead exemption TODAY! Deadline for most counties is April 1st but I’d recommend taking care of it ASAP. A homeowner is generally entitled to homestead exemption on the home and land that was owned by the homeowner and was their legal residence as of January 1st of the taxable year. To receive homestead exemption, a person must actually occupy the home and the home is considered their primary legal residence. You’ve come to the right place! You may need to provide your warranty deed book and page, proof of residence, social security numbers, drivers license and car tag info. Please confirm with the taxing authority that the deadlines for filing have not changed for 2018, and please note that if the property is located within city limits, the homeowner may need to file for exemption with the city as well. If you have any questions about the Homestead Exemption or anything regarding real estate we are here to help!